The Eco Tan mineral (Zinc Oxide) based natural sunscreen is a light but nourishing natural sunscreen that blends beautifully providing a high level of protection for your precious skin. 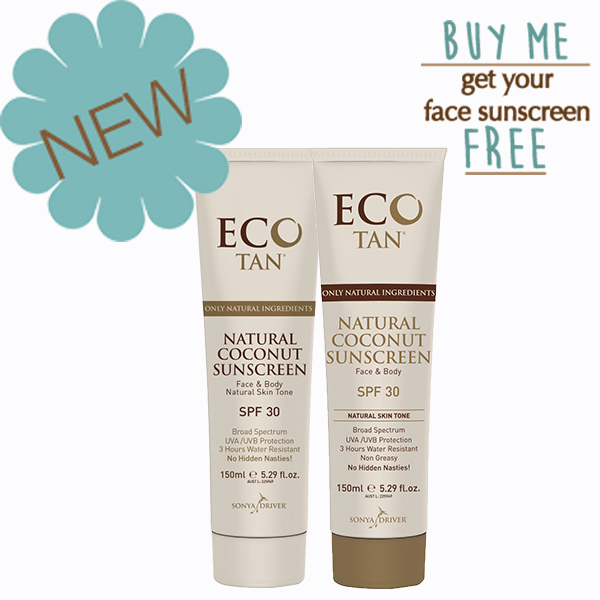 Eco Tan Natural Sunscreen contains a blend of Grape Seed Oil, Shea Butter, Jojoba Oil, Rosehip Oil, Camellia Extract, Cucumber Extract, and has the added benefit of being naturally pigmented to be skin toned. It is non-greasy, quickly absorbed and highly effective. With a natural Coconut scent, this all natural Sunscreen is perfect for everyday, and especially for Summer!